Another day, another dinner dilemma. WHAT DO I EAT? This time I probably deserved it because I refused to go to the shops with R during the day. By the time dinner time rolled round I was pretty hungry and didn’t want to settle on just a sandwich. Simple ingredients in the pantry can be turned into nice hot meals in minutes with a little bit of imagination. 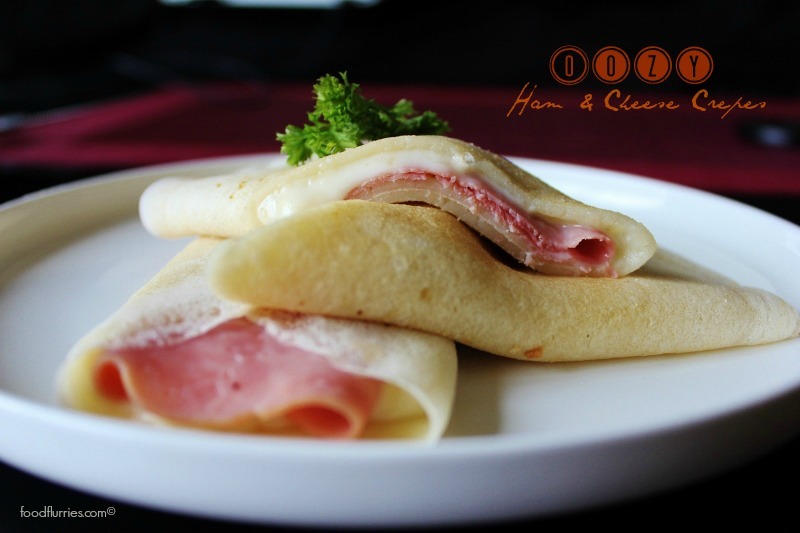 Flour, salt, one egg, oil and water make the batter for this crepe … nothing fancy at all. Thankfully I keep all this in my pantry at all times coz you never know when a pancake craving is going to hit you. 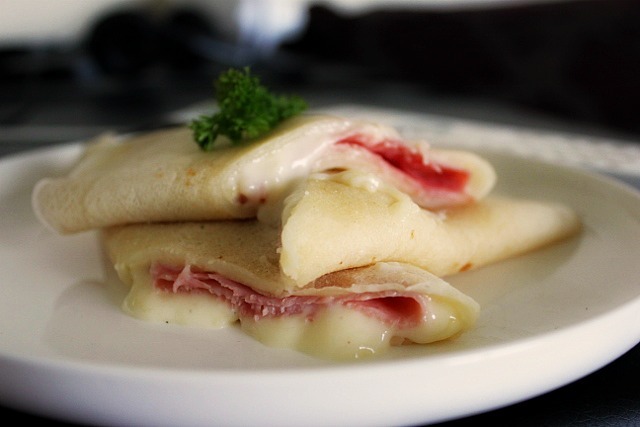 This recipe comes in two parts : 1) Bechamel cheese sauce 2) The crepe itself. If you want to skip the bechamel part you can use store bought, but it is worth knowing how to make your own cheese sauce from scratch coz it is so easy and you will need to resort to self-made bechamel if you can’t get to the stores after business hours. So lets start with the cheese sauce. In the culinary world bechamel sauces are made equal, meaning it is a standard recipe using melted butter, plain flour and milk. This white sauce is the very same that is used in lasagnas, tuna casseroles, cannellonis and other fabulous dishes. 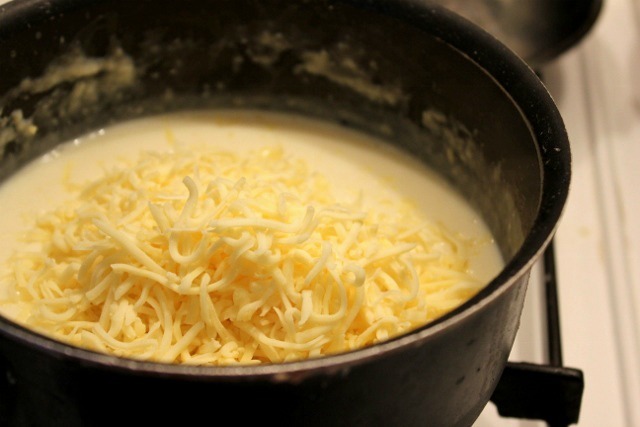 To get a white cheese sauce however, simply grate your favourite melty type cheese into a pot of hot bechamel. Depending on the dish I am making I tend to use nice semi-aged cheese like Cheddar or Gouda. Begin by melting 40 g of unsalted butter in a non stick pot. Make sure the fire is not too high or you will end up burning the butter in like five seconds. Once the butter is melted and starting to foam, add the same amount of flour to the pot and stir immediately with a spatula or whisk. This is what is called a ‘roux‘ … a paste made from hot fat and flour that can be added to soups and stews as a thickening agent. Now add 400 mls of fresh milk a little at a time, whisking constantly to remove lumps. Once all the milk has been added you can up the heat to medium and cook until the mixture reaches the desired thickness. Remove from the stove, add the grated cheese, some pepper and a pinch of salt. Stir to incorporate everything evenly. Now for the crepe batter. For nice thin crepes you want nice runny, lump-free batter. Also, you’d want a good non-stick flat pan or a heavy iron pan. I like adding flavour to my savoury pancakes so I sometimes add onion powder or dried herbs to the batter, but if you’re not digging that concept you can simply stick to plain crepes … just be sure to season it enough with salt. Begin by sifting flour and salt into a bowl. This is also when I would add my herbs or onion powder. Add one lightly beaten egg, vegetable oil and enough water to make a runny batter. Heat the pan on medium heat. Just before adding the batter, swipe the pan with some melted butter using a pastry brush or kitchen towel. Then quickly add a ladleful of batter and swirl the pan to spread the batter in a nice thin layer. Takes practice and the first one is never the good one. Leave the pancake in the pan to cook gently until the sides kinda pulls away from the surface. These pancakes are so thin you only need to cook them on one side. Remove them and set them aside in a nice warm place. Once you have gotten about half a dozen or so, you may begin your crepe assembly. Take one pancake and place it on a cutting board. 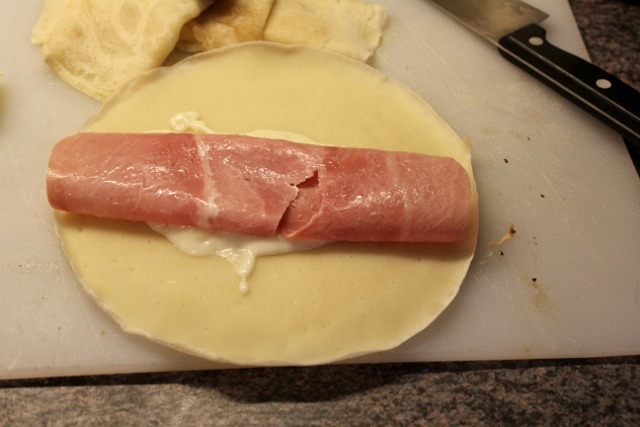 Put a line of cheese sauce down the center of the pancake and top with ham. 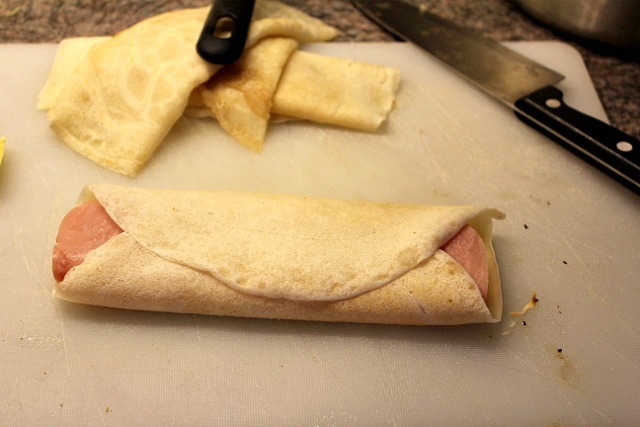 Then fold over the edges to form a snug pancake roll. Plate up and serve immediately while the pancake and filling is still warm. This is a pretty versatile recipe and you can fill the pancakes with any other filling you desire. Creamed spinach + smoked salmon would be a good choice, as would garlicky sauteed wild mushrooms or poultry or even a spicy Mexican bean filling with avocadoes and sour cream. The choice is yours. Next post I will probably make a sweet crepe version filled with all sorts of wonderful fruit and sauces, topped with copious amounts of whipped Chantilly cream of course. But for now I shall enjoy my new found favourite and experiment with various savoury fillings. I can only describe this dish as pure satisfaction … I was really happy with my dinner that night and then I had it again two days later for lunch. Just two pancakes and I was quite content. For a healthier plate, you can always add a fresh green salad to go with the rich pancake.